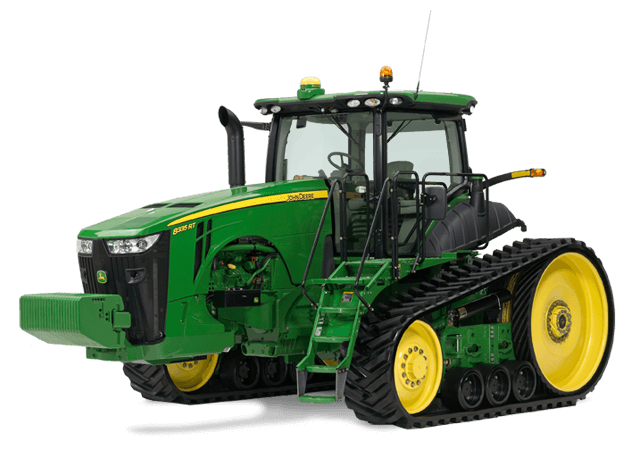 8360RT Tractor - New Tractors - Cope Farm Equipment, Inc. The John Deere 8RT Series Track Tractors offer legendary performance and reliability for farmers who demand more comfort, efficiency, and productivity. A massive undercarriage and the exclusive AirCushionT Suspension System let you transfer more power to the ground while getting a super-smooth ride. Advanced technology and intuitive controls make the tractor easy to operate, while the spacious CommandViewT II Cab provides a mobile office atmosphere with a variety of entertainment features, which include a premium sound system, Bluetooth interface, plus satellite radio and MP3 compatibility. Integrated GreenStarT and JDLinkT technology let you achieve exceptional in-field precision and improved uptime.